White House Says There Are No Plans To Bail Out Puerto Rico : The Two-Way The island's credit rating was pushed to junk territory on Tuesday. The downgrade could affect Puerto Rico's bond offerings. The Puerto Rican flag waves in front of the south wing of the Capitol in San Juan, Puerto Rico. 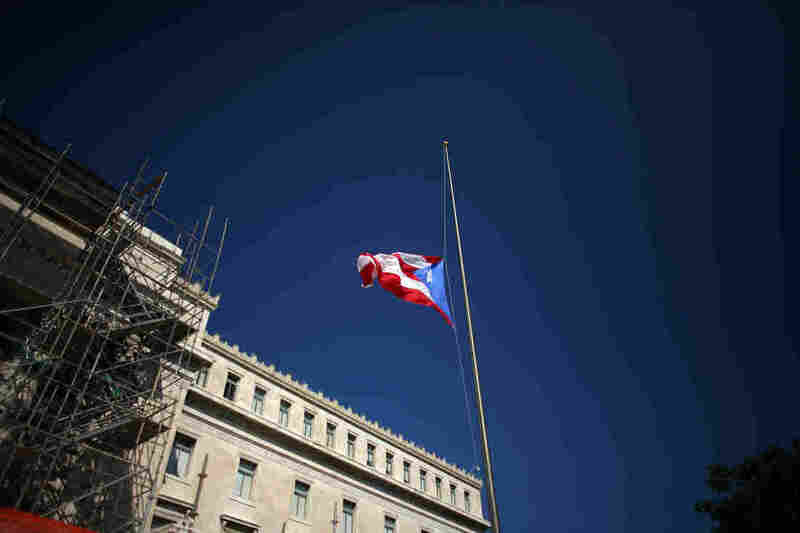 A day after S&P downgraded Puerto Rico's credit rating to junk status, the White House said it was not contemplating a bailout for the island. "A White House spokeswoman declined to comment about the S&P move specifically but said the administration's position had not changed since Jan. 22, when she said that no 'deep federal assistance' was being contemplated. "With roughly $70 billion of tax-free debt, Puerto Rico's economy has for months been under threat of a ratings downgrade by all three U.S. credit ratings agencies." As The Wall Street Journal reports, Puerto Rico's financial plight deepened on Tuesday when S&P made the announcement that it was lowering the Caribbean commonwealth's rating to "BB+" from "BBB-." "The island's bonds are widely held in U.S. municipal bond mutual funds, attracting investors because of their tax-free status at the federal, state and local levels. It has had trouble borrowing after Detroit's record bankruptcy-protection filing last year, which exacerbated a broader municipal bond market rout. "After the S&P downgrade, there was little trading in the island's bonds. Investors in the municipal bond market may react more on Wednesday, but a few signals from traders showed some investors willing to buy the bonds at even lower yields because the uncertainty about Puerto Rico's rating was behind them now. Bond yields move inversely to prices. "Puerto Rico has said it doesn't need to borrow before its fiscal year ends in June. But it wants to prove it can access the public markets that have been crucial to its financing plans, even following what was the worst year for municipal bond returns since 1994."